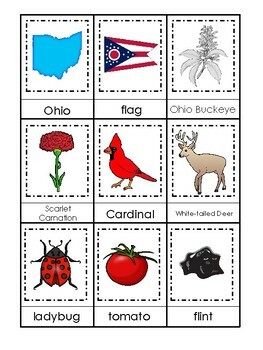 Ohio State Symbols themed 3 Part Matching Preschool Card Game. Ohio State Symbols themed 3 Part Matching Game. 18 card and 9 word strips to be cut out. The games are designed and produced by Teach At Daycare and Books in Arkansas City Kansas. Please see our many other items in our store. We always have full curriculum sets, new games, sight word flashcards, and more!